that this just looks like a bowl of brown mush. But it is one delicious bowl of brown mush. 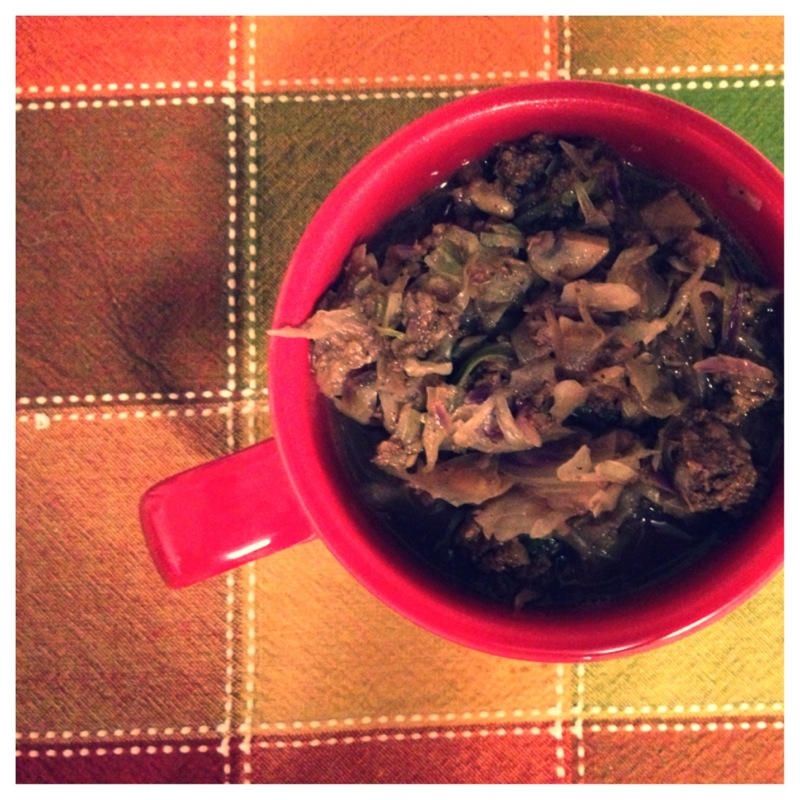 When I first made this, it was a throw-together recipe based on what I had in the fridge. Now, I plan meals to have leftover ingredients for this stoup (thicker than a soup, thinner than a stew = stoup). So, I made a batch of my favorite Asian slaw, by Once Upon A Chef, and had a lot of cabbage left over for this delicious bowl of brown mush. Try it – it’s excellent on a rainy night and it stores, freezes, reheats really well. Serve it carb-free or with white rice. As with many of my recipes, this is about technique and not exact proportions. the technique here is to cook each thing separately so that you build layers of flavor. this recipe can accommodate different amounts of ingredients depending on what you have in the house. for example – i’ve never tried it, but i think celery would be great in this. make it vegetarian by substituting white beans for the beef! any mix of sage, rosemary, or parsley. a note about “meat spice” – as i’ve mentioned before, this is a great spice blend for beef and lamb. look for it at arab and mediterranean stores or you can make your own according to your own tastes (try this one). if you don’t have meat spice, the simplest thing to do is to use a mix of cumin, nutmeg, and allspice. 1. on high or medium high heat, brown the meat in a dutch oven or wide stainless steel pan. browning meat: the first step of adding flavor to this stew is getting a great sear on the meat. i don’t exactly know how this helps, but it’s the same thing that makes steak and grilled burgers delicious. go with it. wait till the pan gets very hot, then add a bit of oil. if you’re using all 85% beef (which i prefer in this dish), you don’t need to add oil first. put the meat into the pan in a single layer and don’t touch it for a few minutes (3-5 min). on the raw meat side, sprinkle a teaspoon of meat spice, crack some black pepper, and 1/2 tsp of salt. peek under the layer of meat and see if it’s got a brown sear on it. yes? good! turn it over with a spatula – still trying to keep it in a single layer. brown again. add another tsp of meat spice and mix the meat up, breaking up the layers. try to leave it kind of chunky. remove the meat, leaving any fat in the pan, and put it aside (it doesn’t have to be all the way cooked through yet). 2. take advantage of the meat fat and brown-ness stuck to the pan by throwing some onions in here. stir to cover in the meat fat and add a couple of bay leaves and sprinkle with a little bit of salt. browning onions: lower the heat to medium and brown the onions. this is really important – when a recipe calls for browning onions, take the time to get them at least light golden, even darker if you have time. 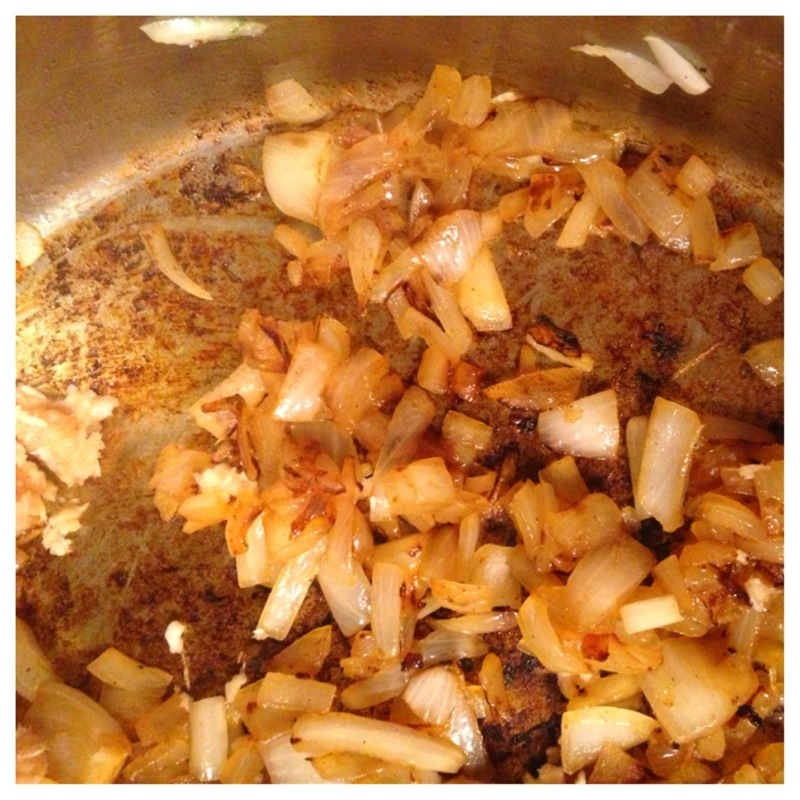 two things are happening right now – the onions are soaking up the flavor of the meat and they’re caramelizing. both of this builds really deep, savory flavors. while the onions are getting delicious, put the mushroom stems in food processor with a few cloves of garlic (or just mince the garlic). once they onions are golden brown, add the mushroom stems and a bit more salt (1/4 tsp). The mushroom stems will produce some liquid, which will help you scrape up any brown bits (which is concentrated flavor) on the bottom of the pan. do this. cook till the whole mixture is well-browned. remove and add to wherever you’re holding the meat mixture. 4. add the mushroom caps. turn the heat up to medium high again (you might need to add some oil this time) and add sliced mushroom caps. add salt (1/4 tsp) and black pepper. cook until the mushrooms are soft…but be careful! as soon as the mushrooms release a significant amount of liquid, you’re done. don’t dry them out because this broth will add great flavor to the final dish. a note on salt: see that i’ve salted every layer of this stew instead of adding a lot of salt all at once at the end. this also builds flavor. after this point, don’t salt the pot until after you simmer the full pot since your broth might have enough salt to finish up the whole dish. 5. add the meat and onions back in. add in one more teaspoons of meat spice and stir to combine. you’re using sage and rosemary (which i recommend), push two full stems of rosemary into the stew in different places. remove the leaves from a stem of sage and stick the sage stem itself into the pot. cover and simmer until the cabbage softens and the ground beef is fully cooked, about 5-10 minutes. taste and add more salt and spices if necessary. 7. to finish, chop fresh sage and rosemary and stir. . You could also garnish with golden raisins (for a little eastern european flavor), toasted pine nuts, or sour cream.